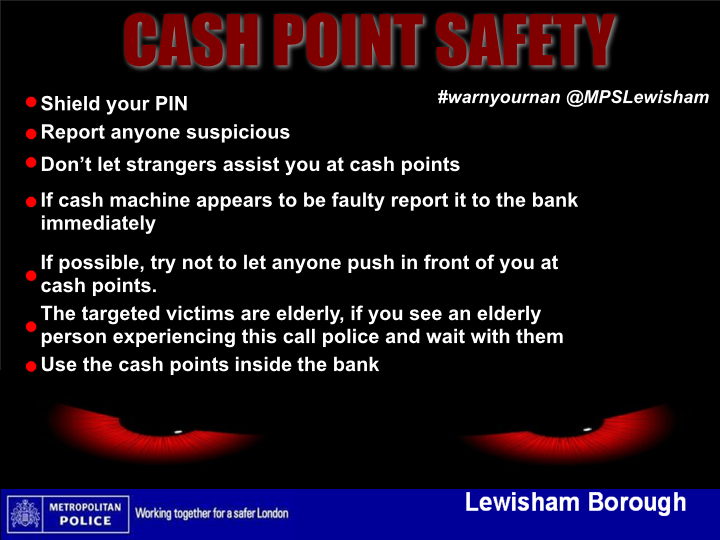 We have just been informed by our Safer Neighbourhood Police Team that Lewisham Borough have had an increase in shoulder surfing at cash points, especially targeting the elderly. The oldest victim has been 91. Shoulder surfing is the practice of spying on the user of a cash-dispensing machine or other electronic device in order to obtain their personal identification number, password, etc. Don't let strangers assist you at cash points. If cash machine appears to be faulty report it to the bank immediately. If possible, try not to let anyone push in front of you at cash points. The targeted victims are elderly, if you see an elderly person experiencing this call police and wait with them. Use the cash points inside the bank. 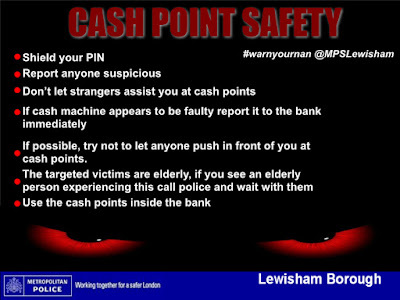 Please be extra vigilant at cash points and pass this information on to neighbours and relatives who you feel would benefit from this advice.